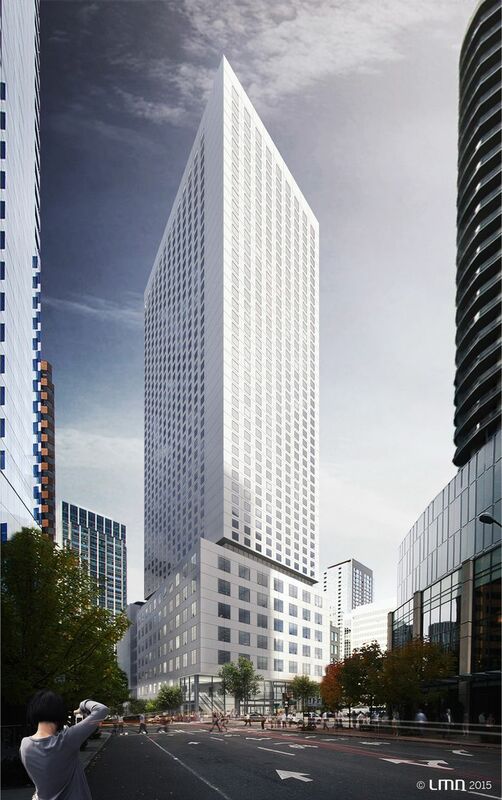 A Seattle hearing examiner's ruling clears the way for construction to begin on the $400 million, 45-story project in the Denny Triangle. A Seattle developer has won a fight against a powerful union to build the largest hotel north of San Francisco. Officials at R.C. Hedreen Co. say a ruling this week by the city’s hearing examiner on an appeal filed by Unite Here Local 8 means they can finally begin construction on the $400 million, 45-story project on the Denny Triangle block between Stewart and Howell streets and Eighth and Ninth avenues. “This has been a pretty bogus scenario from day one with the union using these delay tactics to force us to the table,” said David Thyer, president of Hedreen, on Thursday. A representative for Local 8, which represents about 5,000 workers in the hospitality industry in Washington and Oregon, said it “will assess all the options” with its partner in the appeal, Alliance for a Livable Denny Triangle. Hedreen’s project, known as 808 Howell St., is a 1,264-room hotel above a podium of meeting and retail space, covering three-quarters of the block. The Seattle Sheraton currently is the Pacific Northwest’s largest hotel, with 1,236 rooms. After the city issued a master permit for the project last fall, Local 8 and the alliance appealed the planning department’s decision. Attorney Peter Eglick, who represented the union and the alliance in the appeal, didn’t return calls seeking comment. If demolition and excavation begin in a month, Thyer said, the hotel could open in early 2018. Sellen Construction is building the 45-story tower, which will anchor the corner of Eighth and Howell. The convention hotel will meet record demand for rooms and generate convention business that Seattle can’t accommodate, said Chris Kraus, managing director of PKF Consulting USA, a subsidiary of CBRE. Last year’s downtown hotel occupancy rate was the highest in more than two decades, he said, and hotels are on track to set a record this year. In the battle over the new hotel, the union has pressured the developer to agree to a closed shop so the future 600 to 700 employees there would be required to join the union, Hedreen officials say. In the summer of 2013, the union called for the boycott of the Hyatt at Olive 8 and the Grand Hyatt Seattle, both owned by Hedreen. The union accused the firm of trying to stymie union-organizing efforts of housekeepers and other employees at the two hotels, a charge the company denies. Local 8 helped lead the fight for a $15 minimum wage in Seattle and has been in protracted contract talks with the private firm that manages and owns the Space Needle on behalf of its workers. The union’s influence on City Council is palpable. Hedreen couldn’t secure enough political support on City Council for granting it the L-shaped public alley that runs through the block. “Our informal meetings with council members made it apparent to us we were not going to get a majority of council’s support without cutting some deal with the union, which we’ve resisted all along because we don’t think it’s right to sell our future employees’ rights down the river,” Thyer said. Without the alley, Hedreen has shelved a full-block, 1,700-room hotel proposal that included affordable housing. As a result, the scaled down hotel will have smaller ballrooms — the largest ones will be two 19,000-square-foot ballrooms, instead of two 30,000-square-foot ballrooms. Still, the hotel would have larger ballroom space than other convention hotels in downtown Seattle. In total, it will have about 105,000 square feet of meeting and ballroom space on five floors. The tower’s underground parking will accommodate about 450 vehicles. The southeast corner of Ninth and Howell, a surface parking lot, would remain undeveloped for now. Thyer said the developer could build a small hotel on that corner in the future.